CD attachments were very trendy in the 90’s as a means of extending the life of an existing gaming console. They either offered upgraded versions of existing games or entirely new titles meant to take advantage of CD storage space. NEC did this first in North America with the Turbografx CD in 1990 and was most notably & successfully done by Sega with their Genesis add-on, the Sega CD in 1992. 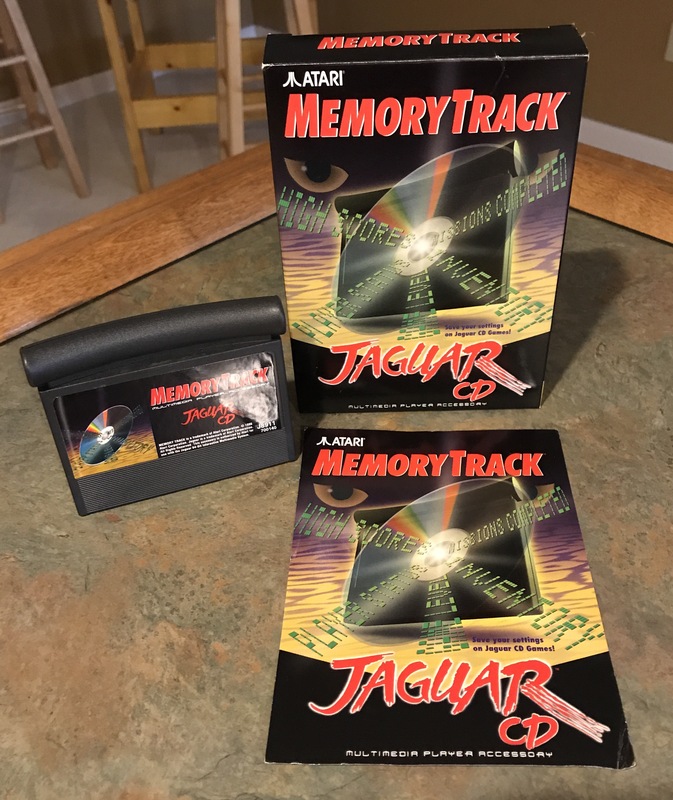 When the Atari Jaguar was released in late ’93 as a cartridge based system when CD-ROM technology was viewed by most as the video gaming media of the future, it should have come as no surprise when Atari announced they would launch their own CD add-on. Originally intended for a late 1994 release, after some delays, they finally came through with their promise (unlike Nintendo for their SNES CD attachment) and the Jaguar CD was released in Sept of 1995. Unfortunately for Atari, by Sept of ’95, the Jaguar was already considered a failure and the releases of the Sega Saturn and Sony PlayStation that same year even further widened the gap between Atari and the market leaders. Unlike the Turbografx CD which was plugged into the console from the system’s expansion port in back and the Sega CD which could either sit under the console or beside the console using similar expansion ports depending on the model, the Jaguar CD plugged directly into the cartridge slot of the Jaguar similar to another Sega peripheral, the 32X. Also like the 32X (and all other CD attachments), the Jaguar CD requires its own AC adapter so to use the Jaguar CD you’ll need to plug in both AC adapter bricks to power them up. The CD attachment also includes a cartridge slot in the back which can be used to either play the Jaguar’s cartridge games if you didn’t feel like unplugging the CD, or you could use it plug in the system’s Memory Track cart in order to save CD based game data/progress. A lot of people joke about how when the CD attachment is plugged into the Jaguar console, the set-up provides a toilet bowl appearance. I won’t argue with that but once again, the AVGN already touched on this to comedic effect so there’s no need for me to rehash that here. The AVGN Jaguar/Jaguar CD episode also pointed out what apparently is a common problem with the Jaguar CD units decades after they were manufactured. Apparently they are fragile and temperamental. 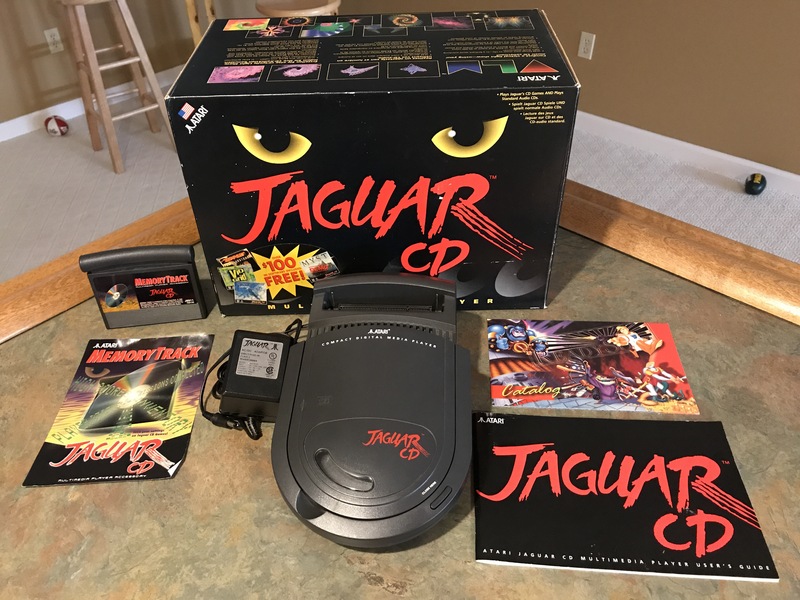 I received my Jaguar CD peripheral complete in box along with my Jaguar console and games in a winning Ebay bid around 2001-2002. Unfortunately, I don’t recall how much I paid for the whole lot and Ebay doesn’t retain data from this far back, but I guarantee I paid nowhere near what the Jaguar CD in box sells for these days. The Jag CD unsurprisingly did not sell well being released late in an already dying system’s lifespan. Including pack-in titles, which I will cover in a separate post, there were only 11 total games released for the system, which is far fewer than any other peripheral from the era. I am not only fortunate to own one in box but also fortunate it still works like a charm. After watching the AVGN episode awhile back, I had concerns about my own Jag CD’s ability to work. I hadn’t played it in probably close to 10 years at that time, so I was definitely worried that plugging it in and firing it up for this month’s blog post would end in disappointment to know I had a dead system. I breathed a sigh of relief when the disc I inserted into the player began to spin and the silent but vibrant Jaguar CD logo appeared on screen shortly after. Yeah, the system may look like a toilet bowl but it’s my toilet bowl and I’m pleased to know I can now look for more Jaguar CD games without fear of wasting money unable to play them. People like to make fun of the Jaguar’s art style but I like the basic black with red lettering and menacing yellow cat-eyes. Unfortunately, only 4 of the 10 titles shown on the back of the box ever saw the light of day via an official release. Living in St. Louis, I wish Brett Hull’s Hockey would have made it. VLM was a trippy light show you could have on your TV while listening to the popular music of the 90’s. Or just the Tempest 2000 Soundtrack.